London to Cambridge the last time round was hard going. A strong headwind, muddy towpaths all sapped energy. This time was a little different. The weather was kinder, the mud had gone from the towpaths but there was still a headwind - not as strong as the last time, but letting us know it was there. We assembled as before near the Royal Festival Hall and including myself there were six other riders. 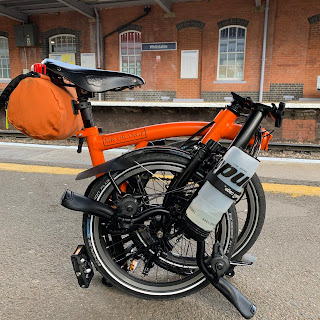 iCrazyBee was joining us a few miles in where he would pick up a loaned Brompton while his is having some repairs. At the sight of the IG Nocturne in a few months time, disaster struck. Jeremy who was on a rather fine modified two-speed, lost some parts to his drailer! Rather than give up, he simply carried on, even though he only had one gear to play with. Chapeau!! The pace was purposeful and we made good time to the Lee Valley Park where we collected iCrazyBee. We also said hello to Mick B and Azudin who weren't riding but provided car support for the entire journey. Last time we made it to the lunch stop, Much Hadham and a rather good pub, 'The Bull Inn' at about 15:00! We were able to get there at just after 13:00 which was much better! After some good food and sugary treats from Mick in the support car we headed off for the final push. As rode, our support car drove ahead and Mick and Azudin got ready to photograph us. I must confess that I felt a little like Lady Diana Spencer just after she got engaged but before she became the Princess of Wales with all the photos being taken. It was iCrazybee's intention to take revenue on Cambridge as last time by his own admission things didn't go as well as he had hoped. The bike Mick had kindly let him borrow appeared to develop a problem with the gear selection and its rear wheel which needed some work at lunch. After lunch, iCrazyBee set off but had to retire to the support car for a while. Perhaps next time with an updated BumbleBee! The next 18 or so miles were a mixtures of hills and flats, hills and flats. Nothing too demanding really. I felt pretty good and wasn't suffering. Trying to match the speed of David (Navigator Extraondinaire) P was tough as he set a mean pace at the front. Two of our riders Ian and Titus were veterans of the long distant group rides. One very useful lesson passed on was that one should shout out sighted dangers such as a pothole and pass it down the line. I greeted this with enthusiasm but when I shouted out, 'hole...hole...HOLE! "I was unable to make this sound anything but like Norman Wisdom. With about 8ish miles to go, iCrazyBee came out to play, as he had done last time, to join us for the last leg. At just after 18:00 we reached Cambridge Station. We had completed the ride in good time, especially when compared to our last attempt! Boarding the train to Kings Cross, I didn't actually feel too bad. I most certainly didn't find the ride easy, but I didn't find it hard either. Perhaps I am getting more used to these rides...fitter? Certainly the training seems to be paying off. Thank you to all those who attended and for all the banter. Even more thanks to David P for his yet again quite excellent navigation. Special thanks to Mick B and his sidekick Azudin for acting providing a support car. How many rides have one of these?! The ride data and maps can be viewed by clicking on the link below.